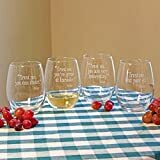 Assorted 21 Ounce TRUST ME Stemless Clear Etched Drinkware Wine Glass (Set of 4) – My Home Wine Bar ! Amazon Price: $76.38 (as of February 1, 2019 4:44 am - Details). Product prices and availability are accurate as of the date/time indicated and are subject to change. Any price and availability information displayed on the Amazon site at the time of purchase will apply to the purchase of this product. 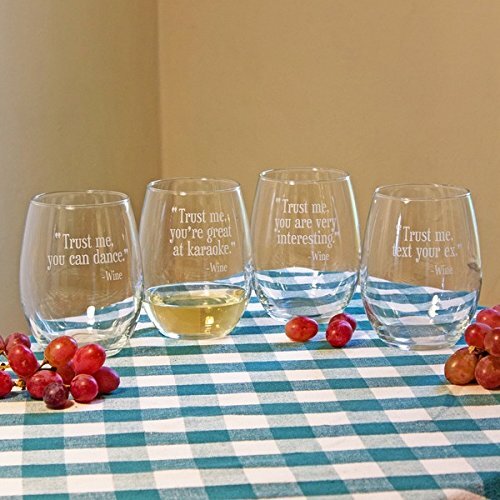 They say that wine can be very persuasive, this assortment of ‘TRUST ME’ Stemless Clear Etched Wine Glasses (Set of 4) would have you believe so, anyway ! Each 21-ounce glass in the set features a different deeply, sand etched design that is sure to raise a chuckle from all who see them. With different designs on each glass, everyone will know whose glass belongs to whom.